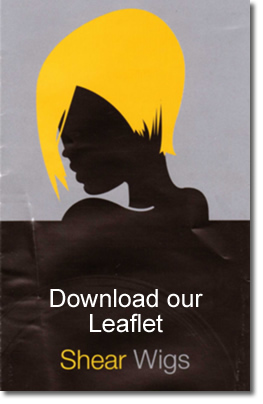 Karen has 25 years experience in hairdressing, specialising in hair extensions and wigs. We have an excellent range of wigs, ranging from synthetic, heat sensitive and 100% human hair. Prices start from £85 and we accept the NHS appliance prescription voucher from Leighton Hospital. Karen studied Racoon hair extensions offering the recovery programme which is a fantastic way to have a full head of hair six months after chemotherapy has finished, please call the salon to have a consultation with Karen. A care sheet is given to all clients advising on the care of your wig. We have a beautiful calming salon in Stone with a private wig room, where you can come and meet us for a free consultation and try on a selection of wigs. As an introduction, we consult with clients and find out what their requirements are. Once the wig has been chosen by the client, Karen can cut the wig to the clients face shape. We will shampoo and condition the clients wig in the salon and style and blow-dry to the client's needs. However, if the client prefers to care for the wig at home we can give comprehensive advice on aftercare. A synthetic wig can be shampooed and conditioned as above but dried naturally. You can send your wig through the post and it will be shampooed, conditioned, steamed and blow-dried for £20.00 inclusive of postage.